I was fortunate enough to be given some vanilla pods for Christmas. I had seen them being used before on television and couldn’t wait to split those pods open and scrape out the seeds. My next thought was what shall I make. I had some double cream leftover from making truffles, ripe bananas that needed using and some ground almonds that were fast going out of date. And what does this all make I hear you ask?! 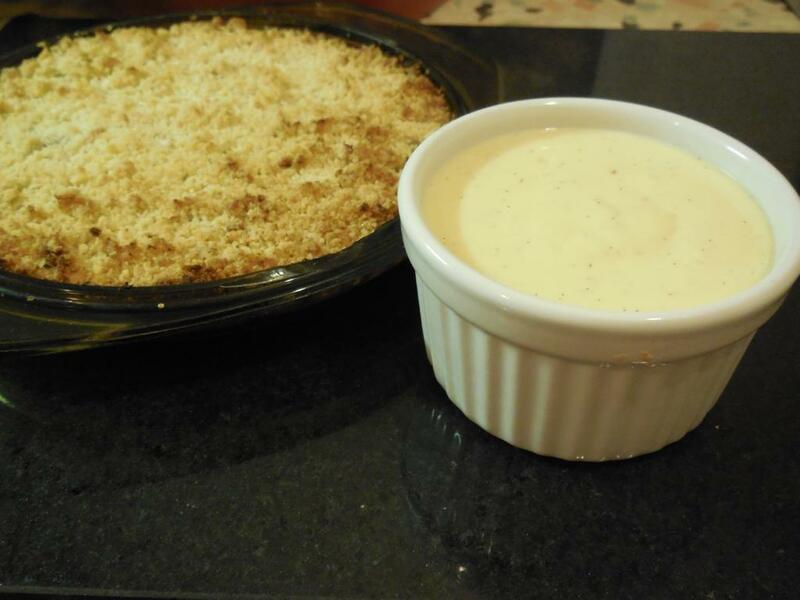 It can only be a delicious banana crumble with homemade custard!!! In a large bowl rub together the plain flour and butter until it becomes a breadcrumb texture. Add the oats, ground almonds, caster sugar, cinnamon and all spice, then stir until it is all well incorporated. In a small pie dish (15- 20cm diameter) chop up 2- 3 bananas and cover the base of the dish. Sprinkle on the crumble mixture and make sure it is fully covered. You may have a little bit of mixture leftover. Place into the oven for 20 minutes or until it has got a golden colour on top. While the crumble is in the oven, pour the cream into a saucepan. Split the vanilla pod in two and scrape out the seeds, then add the seeds and the pod to the saucepan. On a low heat, warm up the cream up until near boiling point. In a large measuring jug add the egg yolks, cornflour and caster sugar and whisk together. Once the cream is ready, take out the vanilla pod. Once all the cream has been added, pour back into the saucepan. On a low to medium heat, stir the custard until it thickens. Don’t let the mixture boil. You will know the custard is ready when the custard coats the back of a spoon. The all spice adds a real flavour kick. Feel free to experiment with others. Baileys truffles are a great use of any spare cream…or it’s a good excuse to make them at the very least!